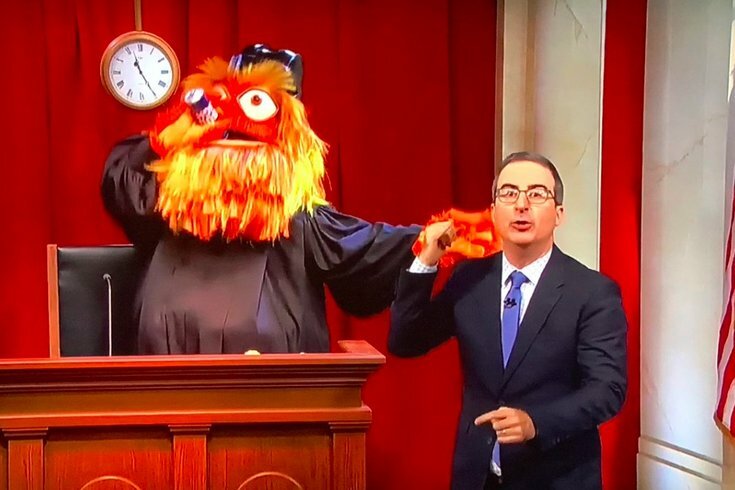 Judge Gritty paid a visit to John Oliver on "Last Week Tonight." John Oliver was ready to spend the entire episode of "Last Week Tonight" talking about the dawn of Gritty, the Philadelphia Flyers' new mascot which debuted at the Please Touch Museum in front of local kids last Monday. "Those kids should be scarred for life," Oliver said in the show's opening. "Gritty looks like the end product of the McDonald's fry guy hooking up with Grimace." Though the Gritty jokes kept rolling in, Oliver had to refocus his attention on the biggest news story of last week – the Brett Kavanaugh Supreme Court hearing. But he didn't transition with ease. "There is nothing that we'd love to do more today than talk about Gritty all night long," he said. "From the fact that he's already done a Kim Kardashian-style photo shoot to the fact that – and this is true – somebody already got an actual tattoo of them on their body." After a comedic yet endearing look at the Kavanaugh hearing – it's definitely worth watching the full clip – Oliver talks about his show's portrayal of the Supreme Court, which uses dogs for each of the judges. Ruth Bader Ginsberg, for example, is a chihuahua ("Sit, and don't die," Oliver says), while Neil Gorsuch is portrayed by a lobster for taking the seat from Merrick Garland. "But Kavanaugh, if he is seated, doesn't even deserve that treatment. He deserves something that constantly reminds people who he is. He deserves something hostile, consistently unsettling, temperamentally unpleasant, and that screams, 'Who the f*ck allowed this to happen?'" You know where this is going, right? The return of Gritty (or, well, the show's knock-off imitation Gritty – the hair and eyes are a giveaway that he's not the real deal). The mascot rolls out, dressed in Supreme Court robes, and pounding a Bud Light in lieu of a gavel.